Sod or seed for new lawns? Many of our customers ask us what is the best way to establish a new lawn. Do you use new sod or simply seed over loam? The fastest way to a new lawn is definitely by sodding over fresh loam. Sod is instant green and takes far less maintenance than seed. Seeding a new lawn can be very tedious and the seed requires a lot of water at regular intervals throughout the day. If the seed is allowed to dry out it will not germinate. The one advantage to seeding a lawn is cost. Seeding is much less costly than sodding. Like seed, sod requires regular watering but it will not die out as quickly as seed will. If you have the budget for sod then sodding your new lawn is the way to go. Regardless of whether you use seed or sod for your lawn you should always make sure to have a good layer of quality screened loam on your property. Rolling and grading the loam is also important so you are left with a smooth level surface. Always remember to create a positive slope away from your property to allow for good drainage. 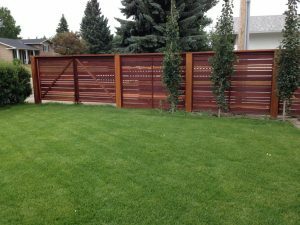 Chinook Landscaping and Design.